Exporter of a wide range of products which include plastic acrylic stands, acrylic display stand and small acrylic stands. We are offering a wide range of Plastic Acrylic Stands. These golden base acrylic stands are ideal for packaging jewelries such as rings, earrings, coin, etc. Our golden base acrylic stands are made from high quality acrylic materials and known for robustness and strength. 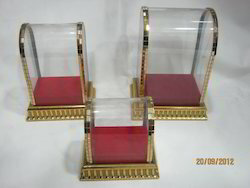 These golden base acrylic stands are flawlessly fabricated by our team of highly talented craftsmen. We are offering these golden base acrylic stands at market leading prices. 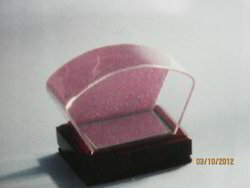 We are supplier of Acrylic Display Stand. These stands are widely demanded by clients owing to excellent finish and appealing look. We use finest quality glass and other components to manufacture these acrylic stands and ensure maximum durability and appealing look. Our acrylic stands are available in all standard sizes and designs. We are offering a wide range of Small Acrylic Stands. Our stands are widely preferred by various clients owing to perfect finish and elegant design. Our acrylic stands are specially designed for various statues. Innovatively designed these acrylic stands are available in various standard sizes and designs. 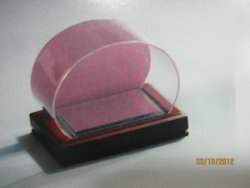 Following the demands of clients, we offer our acrylic stands in various finish and colors. Looking for Acrylic Stand ?